'Spring Caper' RB (Sass Brothers, R. 1949). AB, MB, Early bloom. Yellow blend with reddish pattern. I. stolonifera X Dwarf Bearded. Sass, 1949. 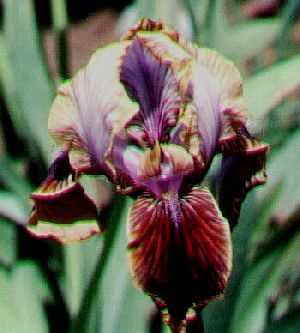 From Supplement To The Comprehensive Checklist of Aril and Arilbred Iris by Sharon McAllister, April 2000: SPRING CAPERAB (Sass Brothers, R. 1949). Sdlg #NIA.MB, height NIA, E. L stoloniferaX Dwarf Bearded. AIS Color Class: S6D (yellow squalens with bitone pattern). '76 CL:Yell ow blend with reddish pattern. Vallette: "yellow, gay ly spalshed purple and oxblood." Sass, 1949. Notes: An RB in both systems. Ref: AIS '49, p. 226; ASI '76, p. 80; Vallette, p.173.